Large companies across the world are invading rural areas in developing countries, allegedly responding to a need for economic development, food security, and poverty alleviation. Such is the narrative of Senhuile, a shadowy company backed by a maze of foreign investors, which is operating in the natural protected area of Ndiaël in northwest Senegal. By establishing an agricultural plantation on land already used by rural communities, this foreign company will bring prosperity and harmony to impoverished rural villages--or so the story goes. A recent Oakland Institute report, Surrendering Our Future, details how Senhuile, with the support of the Senegalese government, is using a development agenda in order to establish agricultural operations that destroy the livelihoods of local people who are dependent on the Ndiaël reserve. According to the story spun by the company, the project will bring development in the form of infrastructure creation, economic stimulation, and social projects including the construction of latrines, public offices, health clinics, and classrooms. The Oakland Institute report, however, uncovers the voices of local people who have been snuffed out by development-centered hype. The people of Ndiaël have not witnessed the miraculous appearance of infrastructure, education, and access to health, but they have experienced blocked routes to access water and firewood, tense and violent encounters with police and security guards hired by the company, and a loss of vital land where they graze more than 40,000 animals that support the pastoralist communities. systems as primitive and “doomed to extinction,” a study conducted in Ethiopia shows that pastoralism is not only less environmentally costly, but also consistently yields more profit than modern and technologically advanced irrigated agriculture. Pastoralism is relevant in the current market. A Netherlands Development Organization study comparing a wide variety of pastoralist communities across Africa, including Kenya, Niger, Burkina Faso, and Benin, highlights the ability of pastoralist communities to adapt to rapid change, respond to market trends, and develop intricate strategies to use scarce resources as efficiently as possible. 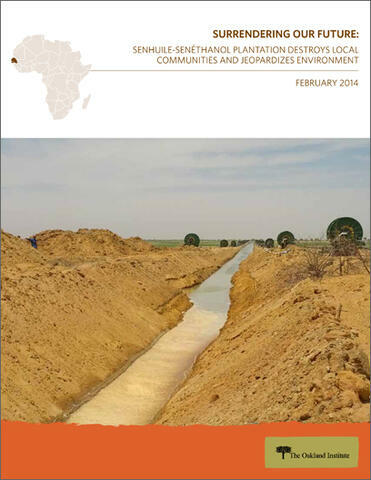 The Environmental and Social Impact Study commissioned by Senhuile after the start of the project proclaims that pastoralist communities are opposed to innovation and modernization, and that they fear the Senhuile project because they are incapable of imagining anything but a backward lifestyle. This completely contradicts the actual efforts of the communities of Ndiaël, who have been trying to adapt and modernize their food production systems over the last few years, but have been constrained by government refusals to grant their request to increase their access to land--the same land that the government easily bestowed to a foreign company. While the communities of Ndiaël are not rich, they do not need to be saved from their “backward” lifestyles by a foreign company. As stated by a Ndiaël pastoralist, “with what we earn from pastoralism we are able to go to Mecca, marry, and live properly. Even though we are not workers with salaries, we are not poor. Pastoralism is our wealth.” The wealth of these communities has been given to foreigners in the name of modernization, completely disregarding the adaptability and relevance of pastoralist systems. Granting productive pastoralist land to foreign investors who will export their products is a driver, not a solution, for underdevelopment, famine, and poverty. Government support for foreign companies that displace pastoral communities for irrigated crop agriculture amounts to “a country investing in making itself poorer.” Policy makers, government officials, and foreign companies are blind to the presence of thousands of people living through sustainable, adaptable systems. They see this land as empty because they do not directly profit from it. It is time for those in power to open their eyes, see the people of Ndiaël, and acknowledge the loss and destruction that exists within the development agenda. * Jettie Word is a 2014 Intern Scholar at the Oakland Institute. Behnke, Roy and Carol Kerven. “Counting the Costs: replacing pastoralism with irrigated agriculture in the Awash valley, north-eastern Ethiopia.” International Institute for Environment and Development (IIED) Climate Change Working Paper No. 4, March, 2013. Netherlands Development Organization (SNV). “Improved Livelihoods for Pastoralists.” SNV Practice Brief Issue 2, January, 2012.